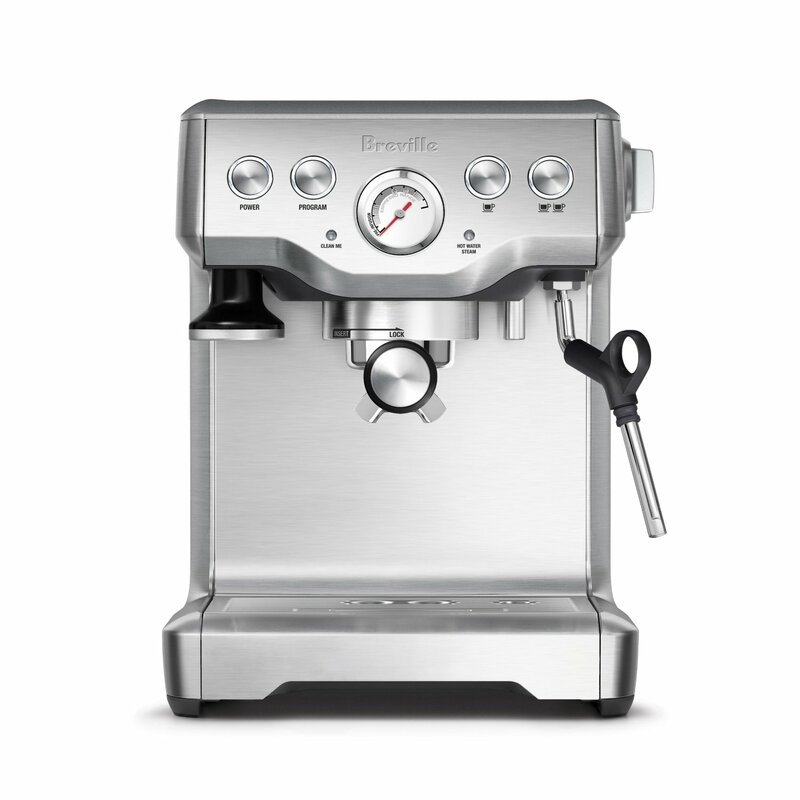 Breville machines are reowned for quality and design and a semi-automatic machine like the Breville BES840XL Infuser Espresso Machine is a high-end machine with style and elegance. 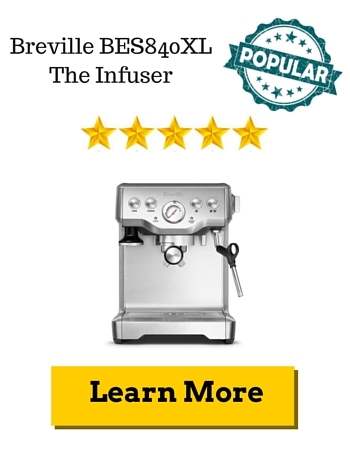 A very unique selling point for the BES840XL is, as the name suggest, getting the best flavour out of the coffee grind by infusing. The Breville Infuser uses slow, steady, low pressure to gently expand the coffee grinds to infuse tiny gaps, cracks inside the grind before using high pressure to produce espresso. The Breville BES840XL Infuser uses coffee grind and it does not come with a built-in grinder. This unit has a steam wand for all you cappuccino and latte lovers. It is made of stainless steel and swivels 360 degrees to accommodate different frothing jugs. It has a large removable water tank at 61 ounces or 1.8 litres. There is a replaceable water filter to reduce impurities and scale, eliminating the need to use filtered or bottled water. The system accurately controls the water temperature with extreme precision for quality espresso. 15 bar pressure pump with presets, manual overrides and reprogrammable volumes. The pre-infusion process deploys low pressure to wet and expand the coffee before subjecting it to higher pressure better crema and flavour. There is a gauge to allow you to monitor and test extraction pressure. Takes a few minutes to preheat the machine, cup, porta filter, filter basket. As the Breville BES840XL is a semi-auntomatic machine, you will need to put the grind, tamp it, purge the group head before you can press the “start button”. The pre-infusion time is around 15 secs. The machine will go into “sleep mode” after an hour and auto-shut off after 3 hours. Stainless steel and durable plastic to last a long time. Comes in 3 different colours – Stainless steel, black sesame and cranberry red. The BES840XL Infuser measures at 12.25 x 10.25 x 13.25 inches (D x W x H) and weighs 17 pounds. There are lights like “Empty Me” and “Clean Me” to help you out. Single and dual wall filter baskets, coffee scoop, stainless steel jug, cleaning discs and tablets, cleaning tool, water filter with holder. There is cup warmer tray at the top of the machine. A drip tray that is removable to make it easier for cleaning. A storage box behind the drip tray for storing cleaning tools and supplies. Excess water after coffee extraction will be gotten rid off to make removal of residue easier. Comes with cleaning tools so you can maintain the unit well. The price of the Breville BES840XL the Infuser Espresso Machine cost around $480 on Amazon with free shipping within US. Bryn Jones received this machine from his wife as a birthday present and after a few trails and errors, he got it pull excellent shots and cannot wait for morning to enjoy another cup. Tonydacrow love how Breville BES840XL makes consistent great espresso and is even more impressed with the customer service of Breville. Build to last, using the same commercial grade porta filters. One of the best seller in the Gaggia range due to its commercial grade quality and high performance. Produce authentic flavour with this unit. the DeLonghi EC702 takes in both pods or ground coffee so you have a choice of normal or fast espresso production. The Breville BES 840XL Infuser Espresso Machine is great for the serious coffee lover who wants quality espresso at home. There is a learning curve for Breville BES840XL but once you get the hang of it, you will be off to making great espresso. 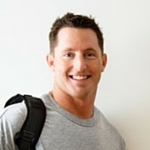 The unit will probably pay for itself after a few months if you can cut out the middleman (Starbucks).